We'll be starting Japanese Cooking 101: The Fundamentals of Washoku next week. If you're cooking along with the course as the lessons are listed, this is your shopping list of fresh ingredients. This is in addition to the staple ingredients on this list. For Week 1 your fresh ingredient shopping list is pretty short. Basically I want you get something that can go into miso soup (omisoshiru) or clear soup (osuimono or osumashi). Here are some suggestions for some classical ingredients, but you can go with something else if you like too. And that's it! The first lesson will be posted early next week. Submitted by maki on 2013-03-01 17:58. Yaaaay, I'm so excited! Definitely hitting up the Asian superstore this weekend. I wish I could find konbu there, though. I'll probably have to buy it online somewhere. If one were buying potatoes for this, can you recommend a kind that will hold up well in soup? I know some are better than other for this application, however, I do not know which those are. Thank you! Any kind of potato that's suited for potato salad, or known as a 'boiling potato', is good since they don't fall apart readily in the soup. I'm going to second Lisa's YAAAAY! I'm really excited to give this a try. On a side note, my daughter just got home today on her Spring Break. She is majoring in forensics but minoring in Japanese, and she was rather impressed that I'm going to learn this. I remember seeing somewhere that tofu and spinach are never to be eaten together because of some chemical reaction in the proteins that make them harmful to the human body? Is this true? I've never seen any concrete scientific research that proves that. If you are worried about it, just don't eat them together. What kind of miso should I got? I've described that in detail on the staple ingredient list for the course. Am very excited to start this - i visited Japan for the first time last year and fell in love with the country and the cuisine and have been trying to replicate the food i had there since. It can be hard to locate some of the ingredients in New Zealand. 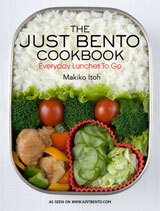 Hello maki :) I'm looking forward to your Japanese Cooking 101! I have one problem though: my flatmate seems to hate whenever I use seaweed in dishes. Obviously I want to stay on good terms with her. So it looks like I'll be missing that special flavour (which I really like). Anyway, this is going to be great! For the soups we will be making, approximately how many servings per recipe? While I am not a huge fan of miso soups, my kids are. Just as I like the clear soups but they don't care for those. Zoe, just put the seaweed in your soup bowl when serving soup and leave it out for your flatmate. Hi. I'm new to your online format for offering JC 101. Could you write a sentence or two describing how the course will be delivered (blog, video, via recipe) and provide the time of day and date when you expect the first lesson to be offered?